In HIV/AIDS patients, PCP is a subacute disease with fever, cough, weight loss, diarrhoea and increasing breathlessness. Prodromal features are often present for 2-3 weeks before the breathlessness becomes clinically problematic. 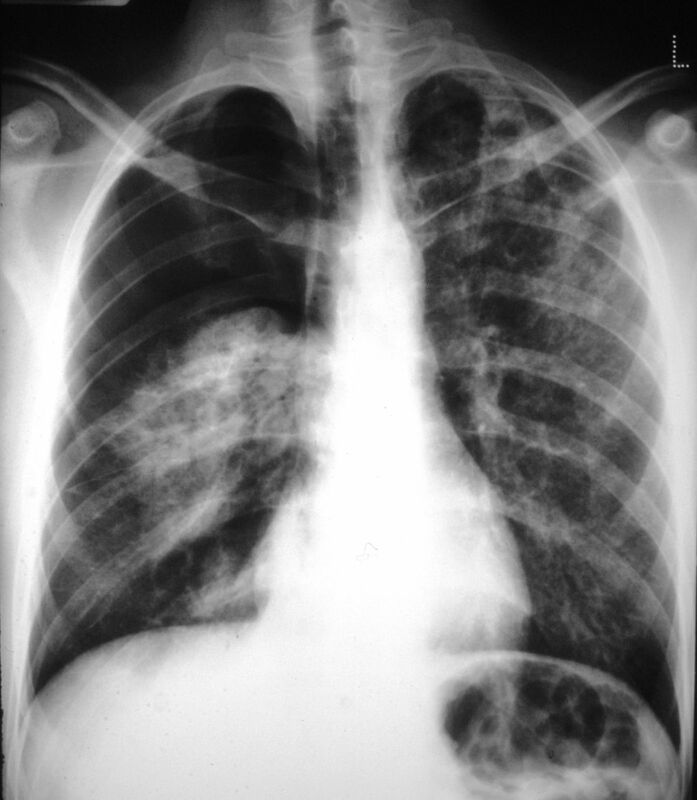 In non-AIDS patients with other immunodeficiency, PCP is a more rapidly progressive disease with more prominent radiological findings and wheeze. Worldwide distribution. Approximately 2.8 million with advanced HIV/AIDS infection are at risk. Conservative estimates produce figures of around 400,000 cases annually, but this is likely to be an underestimate of the true burden. PCP rates rise accordingly with national GDP and decreasing numbers of TB cases, but the reasons for this are unclear. HIV/AIDS with CD4 cells <250 x 106/L, usually <200 x 106/L. Other patients include transplant recipients, corticosteroid-treated patients such as those with brain tumours on dexamethasone, malnutrition in children, hypogammaglobulinaemia and acute and chronic leukaemia and lymphoma patients. Induced sputum and bronchoalveolar lavage fluids are the usual diagnostic specimens. Spontaneously produced sputum and oral mouth wash samples can also be used. Detection is best with real-time PCR or immunofluorescence. Beta1,3-D-glucan in usually raised in blood and can assist with diagnosis. Culture is not possible because the microorganism does not grow in any known culture media. 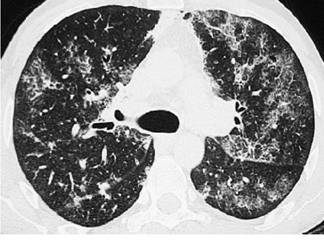 Lung or other tissue biopsy and subsequent histology are sometimes necessary for diagnosis. First line therapy is cotrimoxazole/trimethoprim with corticosteroids for moderate of severe disease. Second –line therapies include pentamidine and the combination of clindamycin and primaquine. Mild cases can be treated with trimethoprim and dapsone or atavaquone. view ECCMID talk by Prof R Miller on PCP. If diagnosed promptly, the survival is 80-90% in HIV/AIDS in the western world. In non-AIDS patients, the survival is only 50%. Prevention of subsequent episodes is critical with prophylaxis, while immunocompromised. Patients with PCP should be isolated in rooms as it is transmissible to other immunocompromised patients. 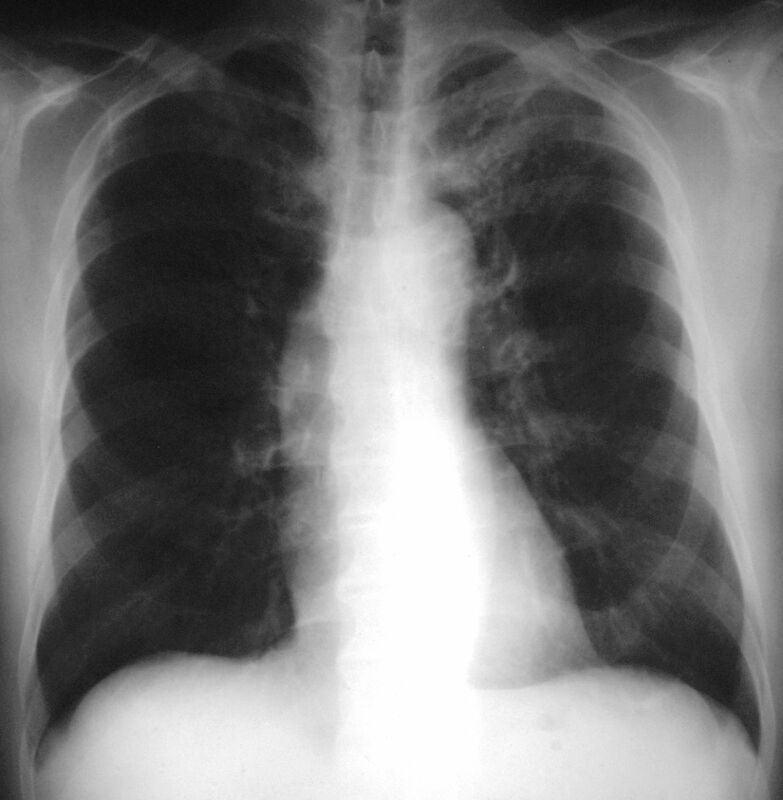 Typical example of moderately severe PCP in AIDS, with bilateral fluffy mid and lower lobe shadows. 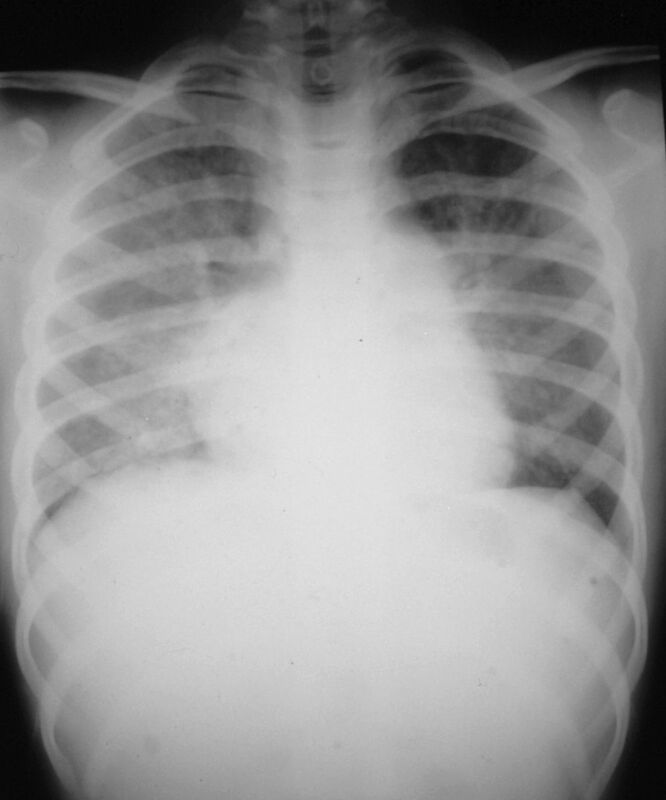 An example of severe PCP in a patient in intensive care. Most of the right lung is affected and the left upper lobe. This patient subsequently died. An example of PCP in a child with a lymphoma on chemotherapy, who was unable to take oral prophylaxis and developed PCP. 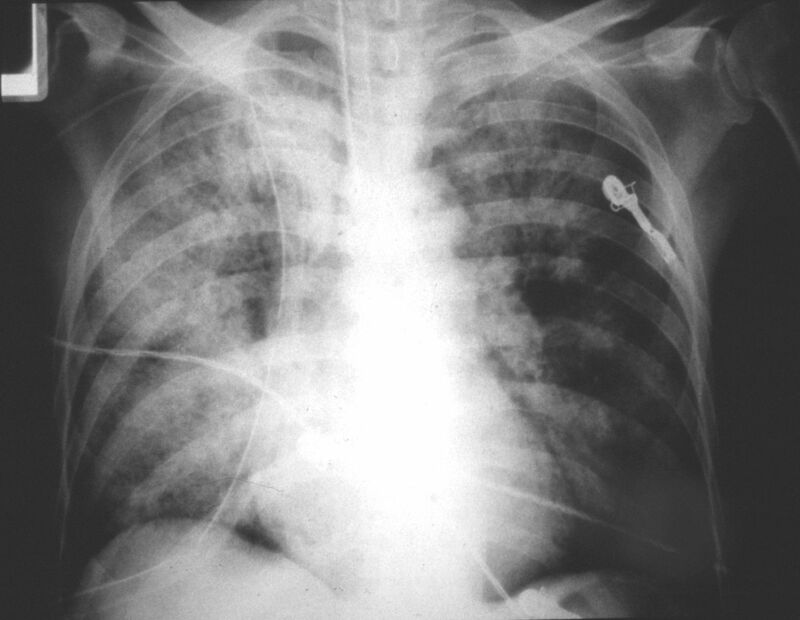 Left apical PCP, a rare occurrence, except in patients on intermittent aerosolised pentamidine for prophylaxis. 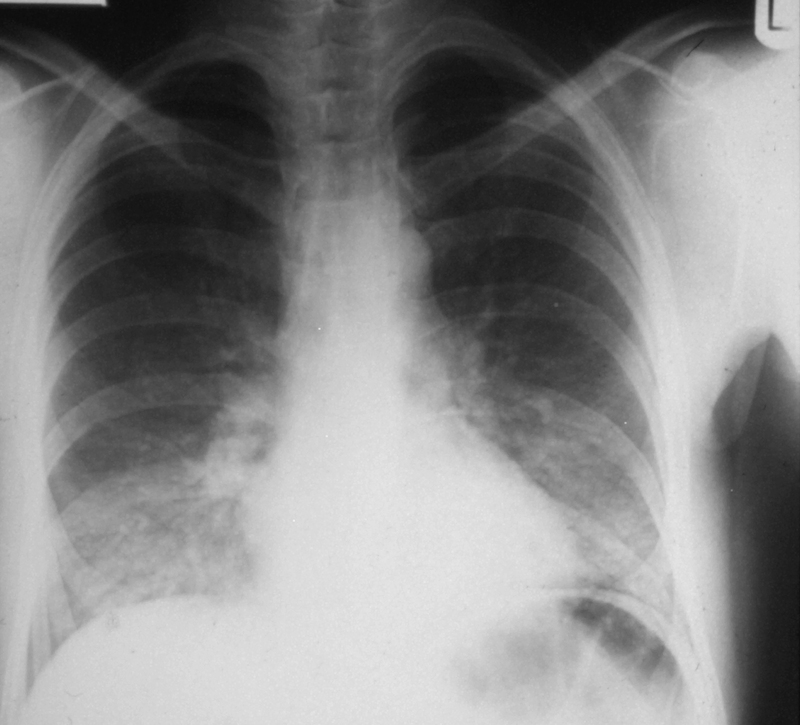 Pneumothorax in PCP (right sided), a relatively common complication. CT scan appearance of the apices in one patient with PCP showing the irregular opacities, consistent with alveolar disease. 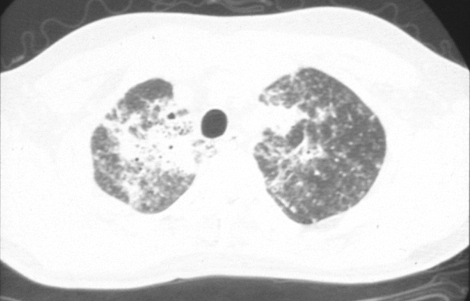 CT scan showing marked bilateral scattered opacities, some with ground glass adjacent, typical of Pneumocystis pneumonia (Courtesy of Sanjay Sharma, All India Institute of Medical Sciences, New Delhi). Occasionally P. jirovecii disseminated to other locations. 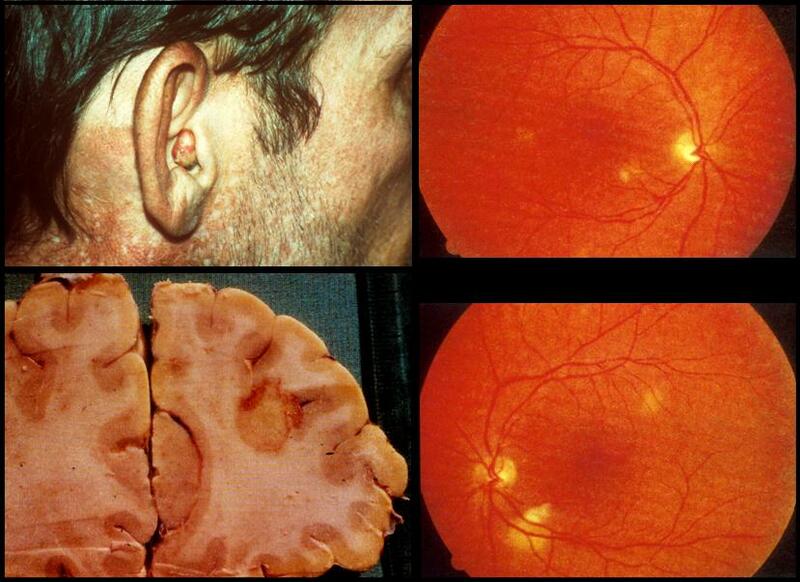 Here are 3 examples; skin in the ear, with a nodule visible, the retina of the eye (the white blotches not where the vessels join the optic nerve) and the brain showing rounded abscesses. 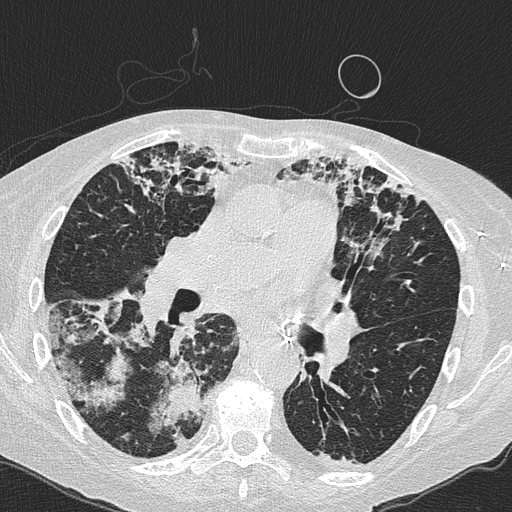 Patchy areas of consolidation with surrounding ground glass caused by Pneumocystis jirovecii in a lung transplant recipient.